There’s something so comforting about a hefty pudding. Treacle sponges, chocolate mud cakes and bread & butter pudding all carry a certain amount of stodge with them and quite frankly, they beat the living crap out of anything light and wispy. Except meringues, but let’s be honest… meringues are in a league of their own. 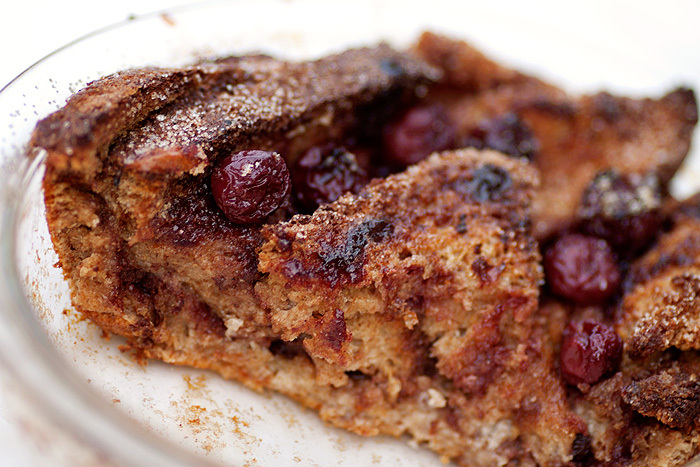 I use wholemeal bread in my Bread & Butter Pudding for no other reason than because that’s what I buy anyway. The addition of jam and a few cherries turns this home-cooked favourite into a slightly more extravagant pud. 1. Butter the bread before spreading a layer of jam over each piece and cutting into triangles. 2. 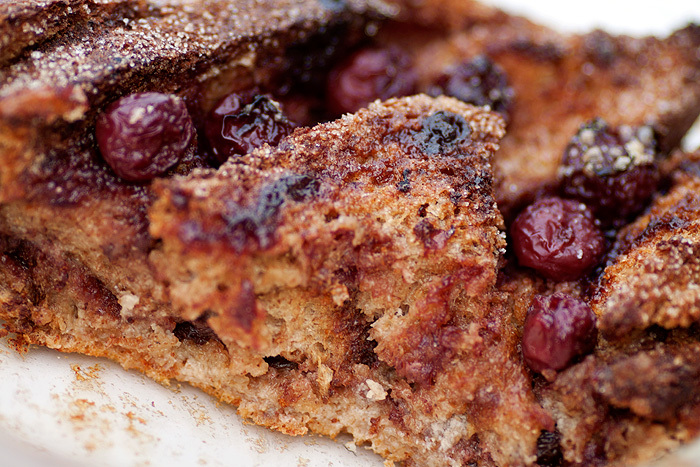 Grease your cooking dish well and build up the layers of bread, interspersing with cherries as you go. 3. Repeat until you run out of bread and cherries! 4. Combine the beaten egg and milk before pouring over the bread and allow to soak for a couple of minutes. Such a simple and inexpensive pudding with a billion possible variations. Try spreading the bread with Nutella instead of jam or throw in a handful of raisins alongside a generous glug of rum! Adjust the quantities of egg and milk depending on how much custard you like or change up the bread to substitute plain old loaves with Brioche, Croissants or Panetone! The possibilities are really quite limitless. Do you have a favourite Bread & Butter Pudding recipe? I foresee more of these on the menu as Winter draws nearer. I *love* your food posts. I bake a lot and it’s awesome to see beautiful photos (with recipes!) come up on my google reader! Blimey that looks like it could almost be good for you! I make mine with brioche, additional egg yolks and cream and have been known to soak prunes in armagnac and scatter them through it – nothing traditional about it but it is heavenly! Althought the absolute winner has to be Delia’s Chocolate bread and butter pudding, if you haven’t tried it you owe it to yourself to! i know, a whole week late commenting on this but i do have extenuating circumstances.